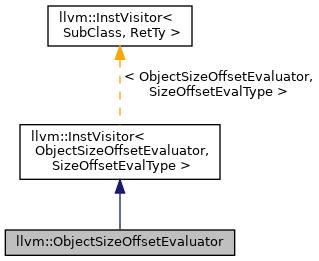 Evaluate the size and offset of an object pointed to by a Value*. May create code to compute the result at run-time. Definition at line 251 of file MemoryBuiltins.h. Definition at line 765 of file MemoryBuiltins.cpp. Definition at line 289 of file MemoryBuiltins.h. Definition at line 293 of file MemoryBuiltins.h. Referenced by compute(), getBoundsCheckCond(), visitGEPOperator(), visitPHINode(), and visitSelectInst(). Definition at line 777 of file MemoryBuiltins.cpp. References anyKnown(), llvm::ObjectSizeOffsetVisitor::bothKnown(), bothKnown(), llvm::SmallPtrSetImplBase::clear(), llvm::ObjectSizeOffsetVisitor::compute(), llvm::dbgs(), llvm::DenseMapBase< DerivedT, KeyT, ValueT, KeyInfoT, BucketT >::end(), llvm::DenseMapBase< DerivedT, KeyT, ValueT, KeyInfoT, BucketT >::erase(), llvm::DenseMapBase< DerivedT, KeyT, ValueT, KeyInfoT, BucketT >::find(), GEP, llvm::ConstantInt::get(), llvm::UndefValue::get(), llvm::DataLayout::getIntPtrType(), getOpcode(), llvm::Value::getType(), llvm::SmallPtrSetImpl< PtrType >::insert(), LLVM_DEBUG, llvm::IRBuilderBase::SetInsertPoint(), llvm::Value::stripPointerCasts(), unknown(), llvm::InstVisitor< ObjectSizeOffsetEvaluator, SizeOffsetEvalType >::visit(), and visitGEPOperator(). Referenced by getBoundsCheckCond(), and llvm::lowerObjectSizeCall(). Definition at line 285 of file MemoryBuiltins.h. Definition at line 281 of file MemoryBuiltins.h. Definition at line 272 of file MemoryBuiltins.h. Referenced by compute(), llvm::lowerObjectSizeCall(), visitAllocaInst(), visitCallSite(), visitExtractElementInst(), visitExtractValueInst(), visitGEPOperator(), visitInstruction(), visitIntToPtrInst(), visitLoadInst(), visitPHINode(), and visitSelectInst(). Definition at line 858 of file MemoryBuiltins.cpp. References assert(), llvm::IRBuilder< T, Inserter >::CreateMul(), llvm::ConstantInt::get(), llvm::AllocaInst::getAllocatedType(), llvm::AllocaInst::getArraySize(), llvm::DataLayout::getTypeAllocSize(), llvm::AllocaInst::isArrayAllocation(), llvm::Type::isSized(), and unknown(). Definition at line 871 of file MemoryBuiltins.cpp. References AllocFnsTy::AllocTy, llvm::IRBuilder< T, Inserter >::CreateMul(), llvm::IRBuilder< T, Inserter >::CreateZExt(), AllocFnsTy::FstParam, getAllocationSize(), llvm::CallSiteBase< FunTy, BBTy, ValTy, UserTy, UseTy, InstrTy, CallTy, InvokeTy, CallBrTy, IterTy >::getArgument(), llvm::CallSiteBase< FunTy, BBTy, ValTy, UserTy, UseTy, InstrTy, CallTy, InvokeTy, CallBrTy, IterTy >::getInstruction(), AllocFnsTy::SndParam, StrDupLike, and unknown(). Definition at line 902 of file MemoryBuiltins.cpp. Definition at line 907 of file MemoryBuiltins.cpp. Definition at line 912 of file MemoryBuiltins.cpp. References bothKnown(), llvm::IRBuilder< T, Inserter >::CreateAdd(), llvm::EmitGEPOffset(), llvm::GEPOperator::getPointerOperand(), and unknown(). Definition at line 989 of file MemoryBuiltins.cpp. References llvm::dbgs(), LLVM_DEBUG, and unknown(). Definition at line 922 of file MemoryBuiltins.cpp. Definition at line 927 of file MemoryBuiltins.cpp. Definition at line 931 of file MemoryBuiltins.cpp. References llvm::PHINode::addIncoming(), bothKnown(), llvm::IRBuilder< T, Inserter >::CreatePHI(), llvm::Instruction::eraseFromParent(), llvm::UndefValue::get(), llvm::BasicBlock::getFirstInsertionPt(), llvm::PHINode::getIncomingBlock(), llvm::PHINode::getIncomingValue(), llvm::PHINode::getNumIncomingValues(), llvm::PHINode::hasConstantValue(), llvm::Value::replaceAllUsesWith(), llvm::IRBuilderBase::SetInsertPoint(), and unknown(). Definition at line 973 of file MemoryBuiltins.cpp. References bothKnown(), llvm::IRBuilder< T, Inserter >::CreateSelect(), llvm::SelectInst::getCondition(), llvm::SelectInst::getFalseValue(), llvm::SelectInst::getTrueValue(), and unknown().